When I first saw the ENO JungleNest in August of last year, I was impressed in many ways. In fact, I was preparing to do a hammock demo at a local outdoor retailer when I saw it on the shelf, and I got permission from the owner to use the JungleNest in my demo instead of the gear I brought. The hammock has been popular enough to make it tough to get, so when I was next in the store, I picked one up myself and I’ve been enjoying it ever since. 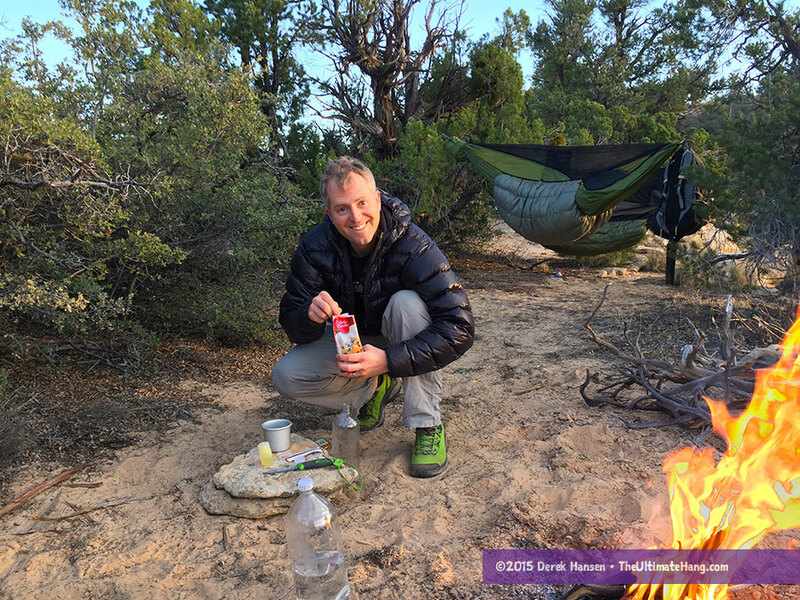 In my first look, I nailed down most of the details of the hammock, so I don’t want to repeat myself too much here, only to recap and give you my impressions, now that I’ve had a chance to take the JungleNest on a few trips and measure it on my scale. Manufacturer: Eagles Nest Outfitters Inc., made in China. The JungleNest differs from ENO’s other hammocks in a few key ways: a hammock body without lateral seams; an integrated, zippered bug net; and lightweight, ripstop fabric. It’s a hammock built with a primary purpose: camping. Sure, regular ENO hammocks can be taken camping, but having the integrated netting makes it faster, easier, and a little more convenient. The lightweight fabric also makes the whole kit save weight compared with pairing an ENO DoubleNest and Guardian Bug Net. To compare, my ENO DoubleNest weighs 494 g (17.4 oz) plus the Guardian at 454 g (16 oz) for a total of 948 g (33.5 oz), roughly 225 (8 oz) heavier than the JungleNest. Even more weight can be saved by removing the stuff sack or even just the compression strap and hardware, opting for lighter options. The JungleNest packs down to be just slightly bigger than the DoubleNest, and thanks to the standard ENO compression strap, the bundle becomes a nice bowling ball for your pack. The JungleNest comes out slightly smaller according to my measurements than what is listed, but it’s not too noticeable because of the simple, gathered-end design (e.g., no length is lost due to a constrained gathered design).The overall size feels just about right for my height (70 in/179 cm), but keep in mind that comfort based on size is very subjective. 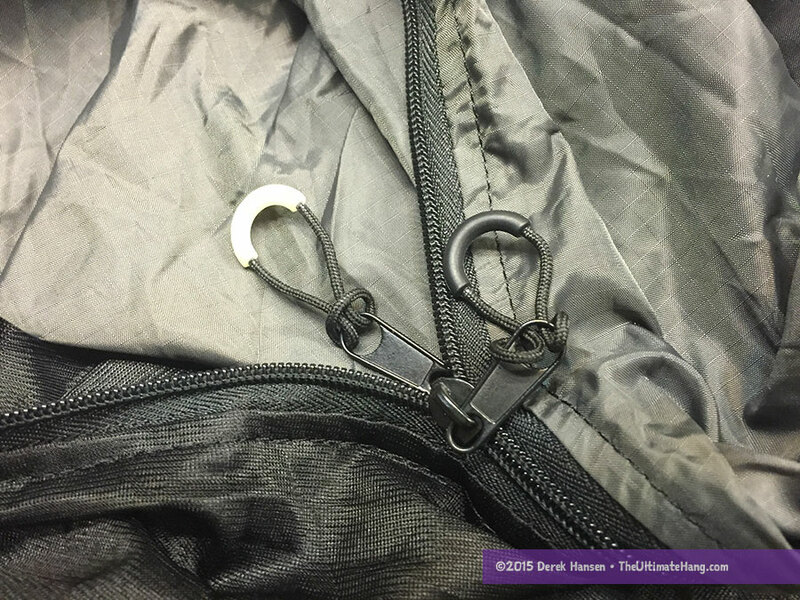 The full-length zipper has double pulls on each end. Glow-in-the-dark zipper pulls are featured on the inside. Because the bug net is not fixed to an internal, structural ridge line, I can reach my arm around the bug net to make adjustments to the outside of the hammock (such as moving an under quilt). I really like the bug net pull outs that are accessible from the inside. It not only makes adjustments easy, but I’ve found that I only need to hook up one side (the head end) to work. Granted, it reduces the overall head space inside the hammock, but when I am laying down, I really only need head room above my head. The netting floats above my feet without touching anything, so it works fine. It doesn’t save a lot of weight to remove the shock cord, but it’s just a mod for a simpler set up. In fact, you don’t even really need to set up the ridge line to make the bug net work. I just clip the bug net pull out to the hammock suspension and call it good. The bug net is actually a little narrower than the hammock body, but not by much (my measurement puts it at 6 inches/15 cm). 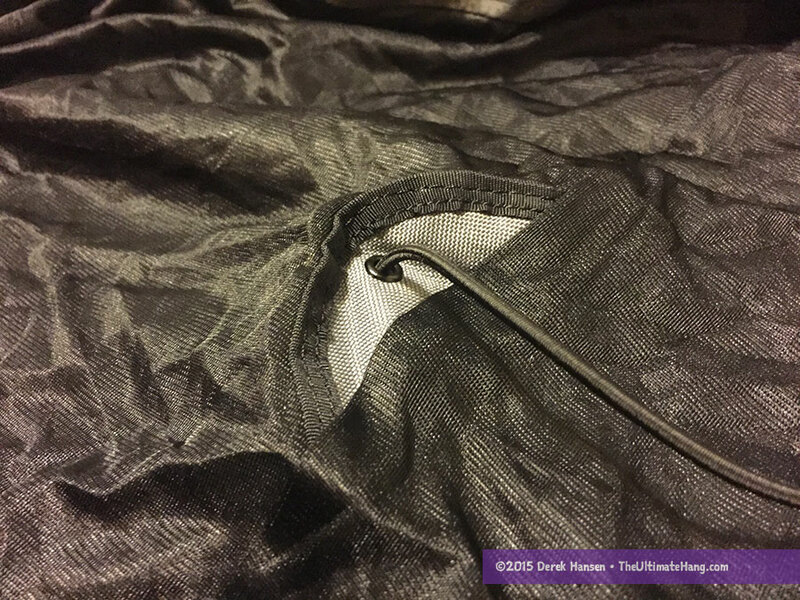 This means flipping the hammock upside down to get to “nettles” mode will work, but since the hammock has the full-length zipper, it is also possible to unzip the netting and just pull it off to one side. You could Sew a few pull tabs as an aftermarket mod to tie off the bug net. The inner pocket is where the included ridge line is stored, but I found it a perfect size for my iPhone 6. There is also a handy pocket on the inside of the large stuff sack. Since it is outside the bug net, it’s not as useful when you’re all zipped up, so I haven’t used it as much. 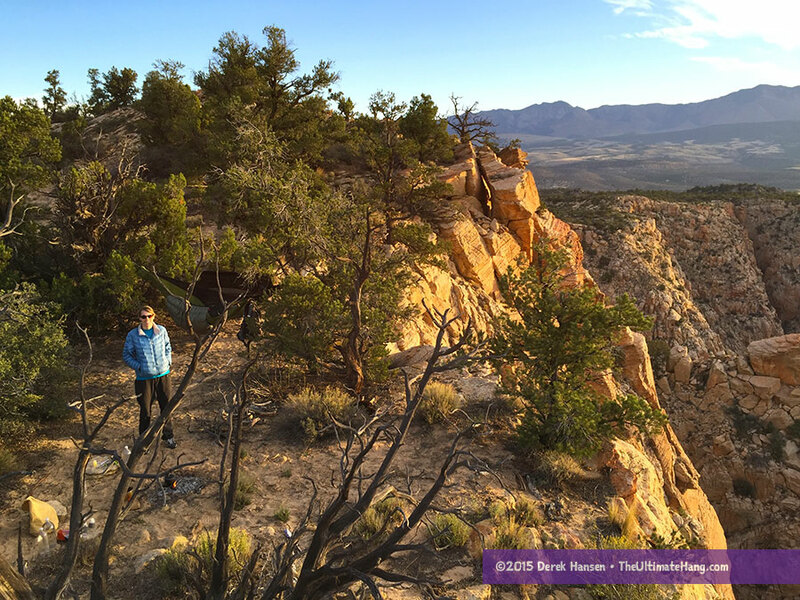 One of the trips where I took the JungleNest was to one of my favorite secluded trails in Southern Utah. 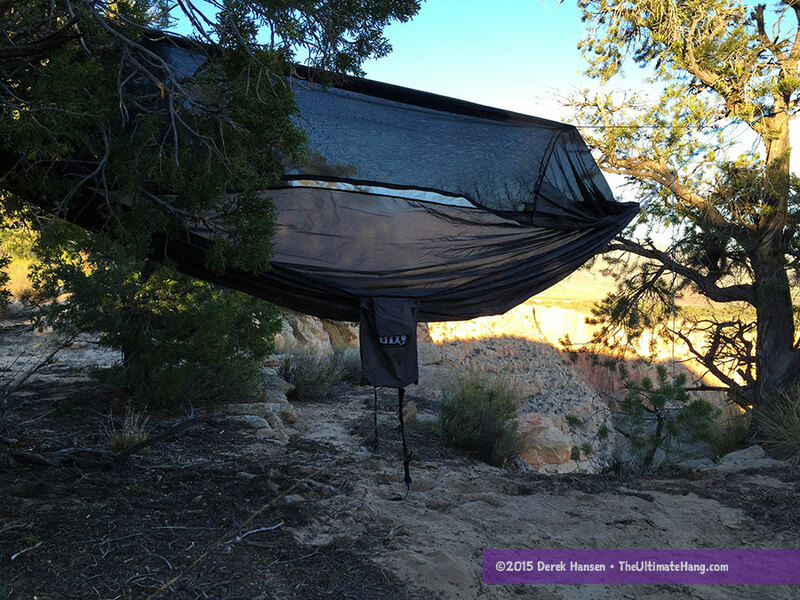 The canyon overlook is a perfect place for hammocks, in a location that is nearly inhospitable to tents. I had the JungleNest perched just a few feet away from a breathtaking view. It was absolutely incredible. As I mentioned in my first look, pitching the JungleNest demands a little more expertise than just throw-and-go. A proper sag improves the lay and helps with the roominess of the bug net and provides a better diagonal lay. After several nights sleeping in the JungleNest, I can attest that the stretch in the nylon is low, likely due to the ripstop and denier. I didn’t notice any barreling or “memory” issues with the fabric itself. One of the first mods I did on the hammock was to modify the stock suspension. I do this in part to test other suspension systems, but also to allow me to measure and inspect the hammock. There’s nothing wrong with the stock suspension system, and when paired with a strap system, the JungleNest is ready to hang. Nothing is better than waking up refreshed from a great night’s sleep in a hammock. Making breakfast with our hammocks in the background. One downside to this style of Jungle Hammock is that the bug net has a tendency to sag in your face. This can be really problematic in buggy areas where biting insects will be able to bite through the netting. Using a side pull-out, roughly where your shoulder is located, will provide enough clearance for full top protection. At US$100, the JungleNest is the most expensive entry-level Jungle Hammock. I wouldn’t consider it a top-tier design, in terms of total features or lowest weight, yet it has enough features and usability to be practical for any camping adventure. The bug net pull-outs are arguably the least complicated design of all the entry-level designs. In terms of size, it matches more closely with the more affordable Byer of Main Moskito Kakoon hammock, although the JungleNest has a more durable bug netting and a higher overall build quality. The fabric isn’t as rugged as the rest of the ENO line, so I wouldn’t put it through the kind of abuse that I would with my Skeeter Beeter or No-See-Um No More, with their tough nylon taffeta (parachute nylon) fabric. I’m thinking this will be a great hammock for my new Boy Scout son who is a little more responsible. The hammock’s set-up is simple enough that he can pitch it without much worry. The only thing really missing (besides webbing straps and a suspension line) is a matching tarp. This is common with most Jungle Hammocks, except for the all-in-one models, as most folks are content to get the right tarp to suit their needs. How tall are you Derek? At 6’2″ the gaurdian bug net never let me lay at an angle and this doesn’t seem any longer than any other ENO design. If I recall from your spreadsheet they make just about the shortest hammocks on the market. I have the original Skeeter Beater Ultralight as well and it’s too small to be comfortable either, which I think is why they updated the model so quickly. Yes. I would agree with your assessment. I’m 5’10” and the hammock is just perfect. I wouldn’t recommend any taller than 6′. I’m 6’2″, weigh 280lbs, have 64″ shoulder girth, and love this robust hammock. I use it all the time hiking in the Arkansas Ozarks. Nice review! I added an internal ridgeline for more storage options and paired it with an ENO Profly. I’m 5’8″, 300#’s and found the stretch to be considerable. Switching from SlapStraps to AtlasStraps helped but I’m most comfortable with combining the JungleNest with a second hammock for a two layer effect. It’s worth mentioning, the bugs can get you underneath because there’s no netting! Otherwise, love it! True about bottom protection. An under quilt, pad, or blanket work. I also treat my hammock to Permethrin. Great review. My girlfriend has a jungle nest and was always complaining about the bugnet in her face. I found the best solution was larks heading the pullouts to the included ridgeline and separating to a desired height. We also just tried putting a pad in between the hammock and bugnet when the hammock is upside down in netless mode and It seemed to work pretty well. I don’t own a double layered hammock but I’m assuming its working in a similar fashion. Yes, that is very similar to how double-layered hammock works. I also like the pull outs that Jacks R Better sells. They can pop on anywhere and don’t require any sewing. Good review Derrick. ENO is a solid company but perhaps do more to market their brand better than anything else. It is nice to see them finally come out with a jungle hammock. I’m a Scout Master in the PNW and have a few boys who’s parents wised up finally and bought them a Jungle Nest when it was on sale at REI (per my recomendation). I’m excited to get out on some back country trips and see how it performs for them. Thanks! I think it will work well, especially when paired with an easy strap/suspension system. All the best with your troop! How tall are you? Height can sometimes have an impact on mid-sized hammocks. The hang angle is also a major factor. Did you try my hang calculator to help find the right angle? Ahh thanks and would you recommend dream hammocks?? Yes! Dream Hammocks are very well-made, high-quality, and have an amazing feature set. I’m currently reviewing a model right now and hope to publish my thoughts in a few weeks. If weight is not a concern, than your options are really open. Any of the ENO tarps will work, but if you want more coverage, I might look at the Ticket-to-the-Moon tarp, or the Grand Trunk Goods tarp, or even the large tarp from Hammock Bliss. They are all in the same price range, but have varying degrees of coverage. If you want to integrate both the bug net and tarp together, the Hammock Bliss Sky Tent is ideal, and also the Sierra Madre Research Nubé. Stand-alone bug nets from Kammok, ENO, and Ticket-to-the-Moon are fairly comparable, but Kammok has the best quality and lowest weight, followed by ENO and TTTM. I’d be curious what your thoughts are on the Skeeter Beeter. I don’t see a review but it appears form the article that you own one. I owned the skeeter beeter ultralight but that has been discontinued. I’ve also handled the current model. I preferred the ultralight because it used one panel of fabric as opposed to three. I guess it is a pet peeve of mine. Other brands don’t do this including the hammock bliss no see um no more, the ENO junglenest, and I think the byer of Maine moskito kakoon. Thanks for the review. I am looking for a good double hammock for backpacking, to include bugnet and fly. One that will work in winter and summer camping. I say double because with grandchildren and possibly my wife I will need the room. Also having extra rrom for gear cannot hurt. I am 6’0″ 220. suggestions? The Clark I think is too expensive. The hennessy seems to be the higher rated but that could be marketing. Just to clarify, this hammock, or any double hammock for that matter, are best for single occupancy. The term “double” just means a little wider fabric but it’s not like a double or two person tent. This is a good jungle hammock for cost. Hennessy and DD Hammocks are also good. I’m 5’8″ 175 pounds. I almost gave up on hammocks because of the ENO Junglenest. I’ve had various mesh hammocks and liked them. When I decided I’d like a camping hammock, like a lot of complete noobs, I went to REI, quickly decided a bug net was a good idea….At first I thought I was just doing it wrong. I finally decided the bug net is too small. I can’t imagine anyone actually tried this out before they went into production. With any kind of a diagonal lay, the bug net drops in the middle and fights any stretching out. A bug net right in your face is a drag. Usually my head ends up pressed against the mesh. Mosquitos must love these. The too tight bug net fights a comfortable diagonal lay. I had all kinds of plans on how to make this hammock more useable but decided it just isn’t worth it.This hammock is probably too short, the bug net is terrible design, it needs to be a lot bigger. With the bug net completely unzipped, it’s a lot more comfortable, but to keep the bug net from bothering me from the one side, I had to use a couple of spring clamps. Your suggestion of flipping the whole thing over or adding a couple of tie-backs is good. ENO should have done this. I also wish REI had spent a bit more time deciding which hammocks to sell in its stores. Being in one of the largest most respected outdoor gear retailers gives this hammock a place of prominence it doesn’t deserve and that undermines hammock camping.